Are you ready for another day of My Creative Time sneak peeks? 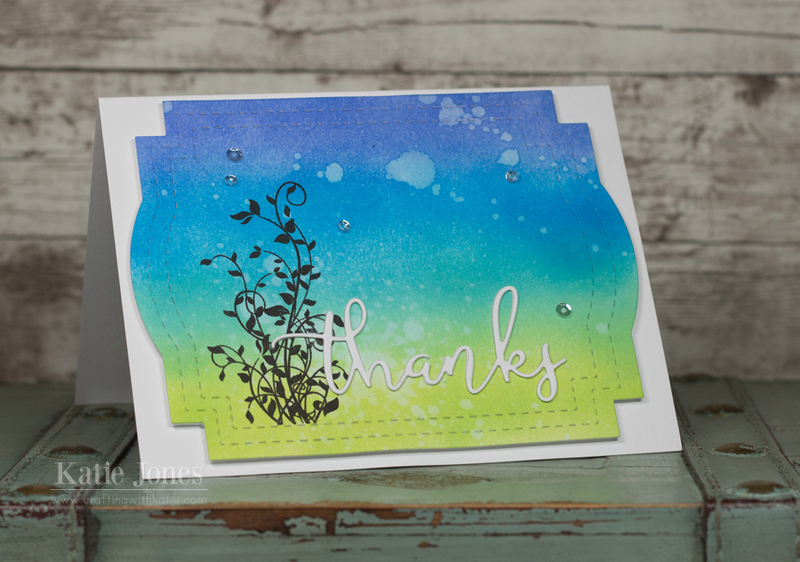 Today we have a fun new set to share with you called Thank You & Frame Dies! This is a great set that I know I will be reaching for time and again. It includes a fabulous frame die, along with a "thanks" and a "thank you" die. I wanted to really showcase this new frame die, so I used it to die cut a piece of white cardstock and then inked it up with Tim Holtz Distress Ink in Twisted Citron, Cracked Pistachio, Salty Ocean, and Blueprint Sketch. I then sprayed it it with the Tim Holtz Distress Sprayer to give it some water splatters. The inking really shows off the double line of stitching on this die! Next I stamped the vines from HELLO You with blank ink, and then added the "hello," die cut from the new set. I actually die cut it twice to give it extra thickness. I adhered this whole piece to my card base, added a few Pretty Pink Posh Sparkling Clear Sequins, and it was finished. This set will be so useful for making quick and easy thank you notes! This die really does show the stitching. I do love the die and font used for "thanks." I can't wait to get this die set to create sets of simple but oh so pretty cards as Christmas gifts. Katie, I always look forward to see what you have created with Emma's new dies and stamps. This card did not disappoint. Thank you for sharing your creativity. Oh My Gosh Miss Katie What a Beautiful Card. Your background is Gorgeous you so did a Spectacular job!! The colors are so pretty!! Pretty card! I really like the background you created on the frame die. This is such a great new die set. Love the shape of that pretty frame die! Beautiful color combo and pretty font on the sentiment! Wonderful card! Love the shape of the new frame. The base you created is stunning and beautiful! Great ink blending! I love the die. Such a pretty card and love how you made your background paper! This new label with double stitching is so pretty! Great job inking and I like how the vines look in black on that colorful background! Love this. You had some beautiful work for this release, this one is no exceptional! What a lovely hombre style - colors are fabulous. Beautiful!! ❤️The ink blended background!!! WOW Katie this is beautiful!! I love that distressed background so much, the colors are beautiful together! Very pretty!! Thanks so much for sharing!